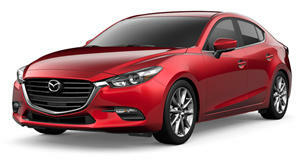 Style meets substance in the Mazda 3 4-door sedan, with a capable chassis paired with either entry level 155hp 2.0-liter or 184hp 2.5-liter 4 cylinder engines. Both engines can be had with either a 6-speed manual or automatic gearbox, though the former is the pick of the two, and front wheel drive is standard. The Grand Touring trim features leather upholstery, a sunroof, bi-LED headlights and a Bose audio system, whilst also packing adaptive cruise control for added safety. Further safety features include forward collision warning, blind spot alert, and auto emergency braking. In this segment, style can often come at the price of ability. 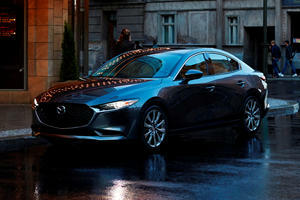 For Mazda, compromise isn’t a word you’ll find in their vocabulary – the Mazda 3 makes this abundantly clear. 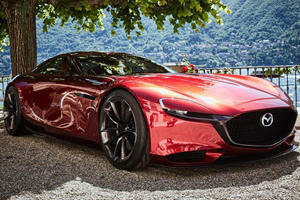 Designed using Mazda’s ‘Kodo – Soul of Motion’ design language, the striking sedan looks phenomenal. But beneath the veneer of elegance there’s genuine breadth of ability, and enough bang for buck to make it one of the segment leaders. When the segment comprises the Volkswagen Jetta and new Honda Civic, that’s high praise indeed. If Audi make the best car interiors, period, then Mazda must be a close second. The materials at times can feel a little flimsy, but the design and ergonomics are nothing short of luxuriant. That’s not to say the materials aren’t impressive – there’s leather and soft touch bits everywhere – but they can feel like a thin veneer without much depth. The 7-inch touch screen Mazda Connect infotainment system is a peach, and a BMW-style iDrive controller is available when prods aren’t enough. Space is abundant for 5 occupants, though those in the back need to be shorter in stature to be fully comfortable. Whilst the accommodation is more than spacious enough in general, the sedan falters and features one of the smaller trunks in class with just 12.4 cubic feet of available storage. The Ford Focus set the benchmark for ride and handling when it debuted in 2011, but times have moved on and the Mazda 3 is now one of the sweetest handling compact cars you’ll find. The light steering is direct and eager, and weights up naturally off center. Send the 3 through a set of flowing curves and it manages side to side weight shifts deftly. It feels far lighter than its nearly 3000lbs curb weight suggests – eager to change direction and feeling light on its feet. Aiding handling are exceptional brakes, and Mazda’s new G-Vectoring control, which cuts throttle input momentarily on turn in to transfer weight to the front wheels for better grip when cornering – subtle, but it works. That agility doesn’t come at the compromise of comfort though – on any surface the Mazda 3 is smooth and composed, and in a league of two with only the VW Jetta really comparing. 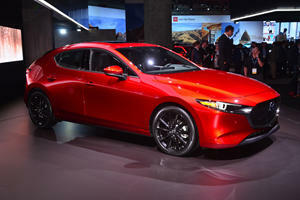 The base Sport trim gets a 2.0-liter SKYACTIV-G engine with a healthy 155 horsepower and 150 lb-ft of torque. The engine is incredibly frugal, with EPA figures claimed at 28 and 37MPG in city and highway conditions. Touring and Grand Touring models get a more potent, rev-happy 2.5-liter with impressive outputs of 184hp and 185 lb-ft. The 2.5-liter boasts EPA figures of 27 and 36MPG for city and highway driving. Both engines can be had with a brilliant 6-speed manual, or a good, but slightly dull 6-speed automatic; and front wheel drive is the default choice of driven wheels. Though even the Sport trim gets the Mazda Connect setup, a rear view camera, and keyless entry, it compromises with 16-inch steel wheels. The Touring trim gets 18-inch alloy wheels, dual-zone climate control, and faux leather upholstery, with the Grand Touring getting real leather, LED lights, a Bose sound system, and a sunroof among other things. Right from the Sport model, the Mazda 3 gets safety features like forward collision warning and automatic emergency braking. Option packs add blind spot alert and rear cross traffic alert, while adaptive cruise is standard on the top trim model. With a host of safety features it’s no wonder the Mazda 3 is an IIHS Top Safety Pick +. Is this the internal combustion engine savior?